At this time of year I always enjoy taking a few minutes to pull out my logbook and also to pull up the blog and look back at flights and posts from the past year and think of the great aviation experiences I have had. I broke some of my favorite moments into two categories: Flight Experiences and Aviation Community. 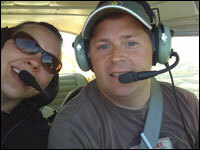 Going into 2008 I wanted to fly more regularly and start to build up some cross country time. My first flight of the year pushed me over the 100 hour mark of flight time. Shortly after I completed my second Biennial Flight Review. Both of those accomplishments were nice but more valuable was returning to a more frequent flight schedule that allowed me to become as confident in the cockpit as I was when I first learned to fly. I took advantage of that confidence to log several cross country flights with nearly 45% of my 2008 flight time being on cross-country flights. This will help should I decide to seek out an instrument rating in 2009. Part of my enjoyment of aviation has come from meeting other aviation enthusiasts. Every pilot is aware that the pilot population has been dwindling and if we are to protect the interests of general aviation we need to start rebuilding the aviation community. In 2008 I had several ways to help spread my love of aviation. I enjoyed meeting many fellow aviation enthusiasts through the Chicago Aviation Meetup Group. Although we had fewer meetings than I would have liked we did enjoy checking out a flightline, Flying-in to Lansing for lunch and meeting Meeting AOPA President Phil Boyer at an AOPA Town Meeting. Another great aviation community moment in 2008 was when several Midwest members of the online aviation community, myTransponder, met in person at Janesville, Wisconsin for the first myTransponder fly-in. We had 15 members from three different states fly-in to talk aviation over lunch. Although, this is my year in review post I hope to fit in one more flight before the year concludes. I will post an update on that flight should the weather hold-up.